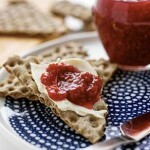 I've included complete instructions on how to make jam, for pure personal reasons. I was the recipient of a mother who loved to can and with 4 children in the house and working full time, I didn't have the opportunity to learn from her because she lived in the Interior of BC. So finally I am taking the time to learn everything that I should have taken the time to learn when my mom was with me, I'm sure she's looking down at me and smiling, I am finally taking after her and learning so I can teach my girls. Lemon Juice - 1 tbsps. To sterilize canning jars. Put the rack in a water-bath canner or place a heatproof rack in a large, deep pot. Place three 8-oz canning jars on the rack and add enough water to fill and cover the jars by at least 1 inch. Cover and bring to a boil over high heat. Boil for 10 minutes. Turn off the heat and leave the jars in the pot until ready to use. Place jar lids in a small saucepan, cover with water and gently simmer for 10 minutes (do not boil). Turn off the heat and leave the lids in the water until ready to use. Rinse raspberries briefly under water and thoroughly drain. Combine the raspberries, sugar and lemon juice in a large pot. Cook over high heat, stirring frequently, until the sugar is melted and the mixture comes to a boil. Reduce the heat to medium-high and cook, stirring constantly, until the berries have broken down and the mixture is thickened and shiny, 8 to 10 minutes. Remove from the heat. If using rose petals, add to the jam and stir for about 1 minutes; remove and discard (or stir in rose water). 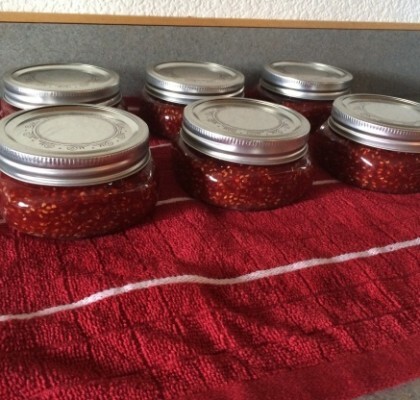 Remove the jars from the hot water and immediately ladle the hot jam into them to within a 1/4 inch of the rim. (Don't overfill the jars; store any extra in the refrigerator and eat it first; or like me you would have put an extra jar or 2 in the pot). Wipe the rims with a clean cloth to ensure a good seal. Place lids and dry rings on the jars. Tighten until just finger-tight (won't move with gentle figure pressure) but don't over tighten. After 24 hours of cooling, unscrew the rings and wipe any excess moisture off the jars. Then test for the seal by pressing lightly on the center of the lid. It should have a slight concave indention and neither yield to your pressure nor pop back. If the seal is not complete, store in the refrigerator. Make Ahead Tip:Store at room temperature for up to 1 year if processed in a water bath. 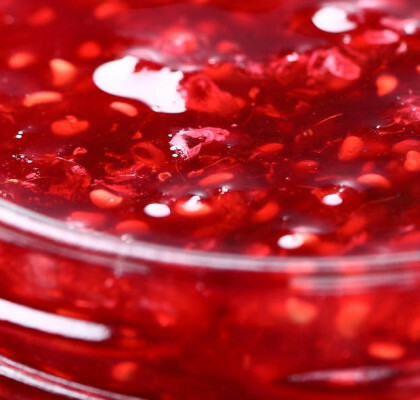 In this easy jam recipe, a few fragrant rose petals add a floral nuance to otherwise delicious but regular raspberry jam. If you don’t want to can the jam, store in the refrigerator for up to 2 months. Serve with crackers and cream cheese or spread onto a vanilla cake for a healthier filling or frosting.